Let’s talk water. Water is one of the key elements to survival, but can often be overlooked in our food storage efforts. Well let’s not overlook it! I’ll dedicate the next few weeks (well, Tuesdays anyway) to giving you all sorts of information about water storage. But let’s start basic. The first thing to know is how much we should be storing. The general rule is to store 1 gallon per person per day. That sounds like a lot because I know I don’t drink one gallon of water in a day. But this amount covers drinking as well as other needs such as washing, cooking, brushing your teeth, etc. It is recommended that you have enough to last for at least 72 hours, and ideally enough to last for 2 weeks, or a month if at all possible. So, 1 gallon x my family of 4 x 14 days (2 weeks) = 56 gallons. And 1 gallon x my family of 4 x 31 days (1 month) = 124 gallons. So I know what I’m aiming for. But honestly, I suggest even more than that. This amount of water does not cover things like showering, and flushing a toilet. And I guarantee ya’ll that if we were without water for two weeks or a month, I’m gonna want to shower and flush the stinkin’ toilet! 😀 So for me, personally, I store at least 2 weeks worth of purified drinking water (but I’ll keep working toward a month), and in addition to that, I store as much treated tap water as my space will allow. We’ll go into treating water and what not later, but the point is… don’t aim for the short end when it comes to water. Water is more important and life sustaining than food! Children, nursing mothers, and people who are sick need more water. Very hot temperatures can double the amount of water needed (so take into account where you live). 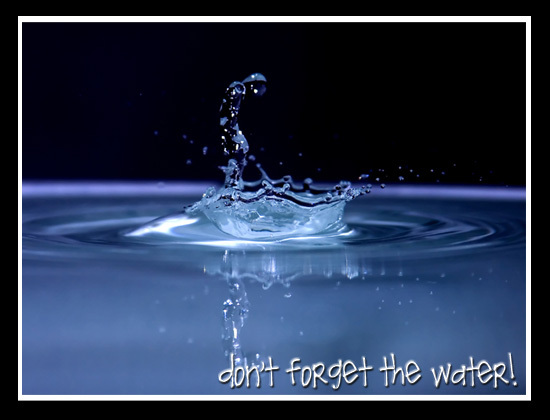 To reduce the amount of water needed, limit your amount of physical activity. By the same token, if you are physically active, you need to boost your water intake. If you have pets, you should generally store about 1 quart of water per day per small pet. So plan for you and your family’s needs accordingly and then be at peace knowing you’re prepared.